3 Great Ways to Spend the National Holiday | WWAM Bam! The 1st of October once again sees the Chinese flag hoisted up on every storefront and the more patriotic homes, but mainly China’s “Golden Week” is famous for creating “people mountain people seas” all over the country as the nation has a week off work and flocks to the most famous tourist destinations. Stories of families taking walkie-talkies onto mountains, because the risk of losing one another in the masses of people is real, abound. Each year the burning question facing people likes us, who maybe prefer not being squished to a pancake while attempting to get a picture of the Forbidden City, Terracotta Warriors or the sun-Yat Sen Mausoleum, is where to go? Is it easier to just hide out at home for a week? But then, how can you let a good week of potential travel time go to waste? That sounds almost blasphemous for travel nuts. So below find X great ways that our contributors have spent their national holidays. 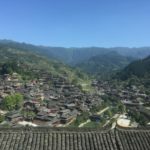 Golden Week in Guizhou – Ancient Ming and Miao village, Bike tours and no people! In September of 2016, a quick Google search on “where do the fewest people go during Golden Week” revealed that Guizhou was top of the list. 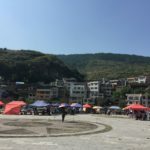 A bit more research, and I discovered Qiandongnan, a prefecture that is home to the Miao minority and one of its, granted, fairly touristy villages. 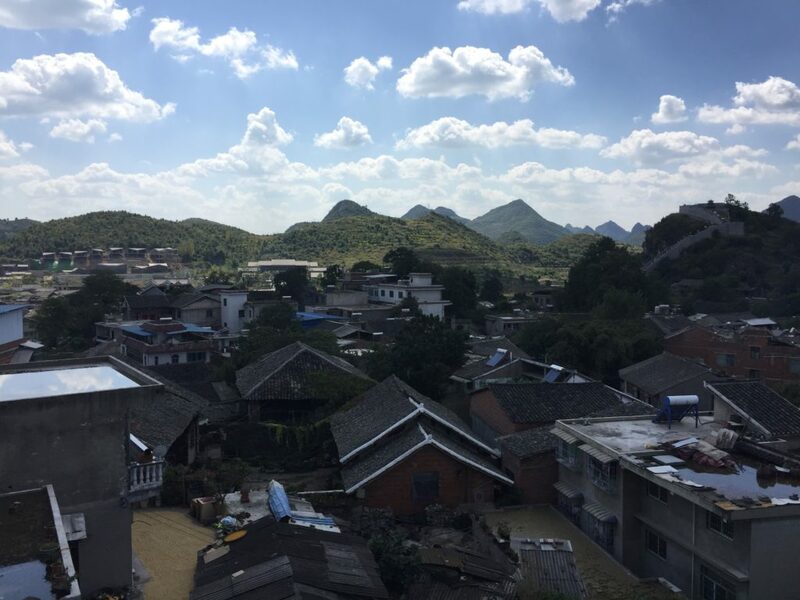 The suggestion was to choose Kaili, a rather small town within this prefecture, as a base and then travel to the Xijiang Qianhu Miao Village (link in Chinese) from there. Kaili does have an impressive high-speed railway, that is just about 1 hour ride from Guiyang, the capital of Guizhou, which in turn sports an airport. In Guiyang, I opted for Qingyan, an ancient town dating back to the Ming dynasty (14th century) as our location for the night. While the ancient town itself was crammed with tourists on the main roads, as soon as one stepped into side streets, where our little paradise of a hotel was located, it was instantly quiet. Exploring the town by day, but being able to flee the hustle and bustle when we felt it was too much was ideal. Kaili was even better. 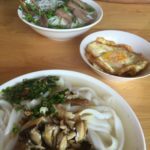 Admittedly this city is nothing to write home about, but we rented bikes and did a bike tour to the surrounding villages, ending up in a tiny town called Zhouxi Zhen 舟溪镇, where we had a delicious bowl of noodles with chicken broth and mushrooms. Th town also has local Miao celebrations but is not touristy at all. More importantly, the bike ride really gave us an insight into local life off the beaten track. 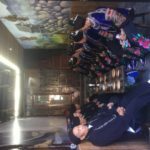 We did do a daytrip to the Miao village and while part of me was disappointed to not have stayed overnight, as it is quite beautiful, the part that didn’t like the hordes and hordes of people plus the massive commercialisation of the village confirmed that we had picked the right place in Kaili. A fun escape from Golden Week craziness! The best chicken broth and mushroom rice noodles ever! 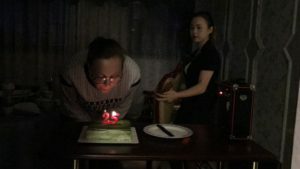 Golden Week in Shanghai – Birthday Celebration! Ever since studying in China last year, I always look forward to Golden Week. It’s not only because I have a week off of school, it’s because my birthday is on October 3rd, two days after National Holiday. In the United States, I never enjoyed celebrating my birthday because my older brother, younger sister, and I have our birthdays in the same week. (I’m not kidding, my sister’s is the 6th and my brother’s is the 8th.) Anyways, I enjoy Golden Week because I get to celebrate my birthday without school or work! For my birthday celebration, I started to celebrate early on the 2nd. My friends and I had tacos for dinner and then went to sing at karaoke. Unfortunately I had gotten a headache by the end of the night, not sure why, and left all my friends at 2am! On my official birthday, I went to Songjiang district to stay with my friend that I went to Yunnan with this past summer. She definitely spoiled me and gave me gifts. Her son, Jimmy, gave me a birthday card that said in English, “Happy Birthday! Holly, I wish you a soulmate.” No idea what that means, but it touched my heart. After this week of relaxation, I really don’t want to go back to school on Monday! 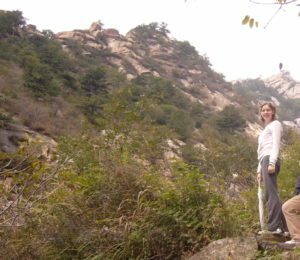 Several years ago in the Golden Holiday I went on my first Nong Jia Le trip to a mountain on the outskirts of Beijing. The attraction of a Nong Jia Le getaway is to return to nature. The term does include a wide range of accommodation but I personally prefer the more traditional kind in a courtyard surrounding a working farm. The courtyard we stayed in had the option of a kang (traditional Chinese bed) or newer ensuite rooms. The menu for dinner was full of local dishes cooked on site by the owners. We ordered some wild picked vegetables and they helped us prepare a barbecue. In the morning we set off early to climb the mountain. The local farmers made natural cooling pools in the streams with rocks within which they kept refreshing drinks, cucumber, and watermelon for the passing tourists to buy. At the summit one seller had an allergic reaction to an insect sting, his eyelid by then swollen and blinding him in one eye. Thankfully I was carrying my first aid kit and gave him some medicine. Back at the courtyard we were greeted with a spread of delicious home cooked food. The owner took us to meet the honey bees lady whose local honey we had enjoyed at breakfast. They also provided Nong Jia Le accommodation including one kang that could sleep about 30 people! We bought some honey and stored it in our empty water bottles. I highly recommend asking your friends for Nong Jia Le recommendations. Fewer tourists, great food, and great company.